Valentine Sandwich Cookies- Creamy pink buttercream sandwiched between delicious homemade chocolate heart shaped cookies. A fancier and prettier version of homemade Oreos. Happy Valentine’s Day tomorrow! I hope you all have a very wonderful day and spend it with your loved ones! Sorry I have been MIA but I was on vacation having the time of my life at Disney World! It was so amazing. I hope you all get the chance to visit there if you haven’t yet. This recipe has been something I have been wanting to create for a long time. 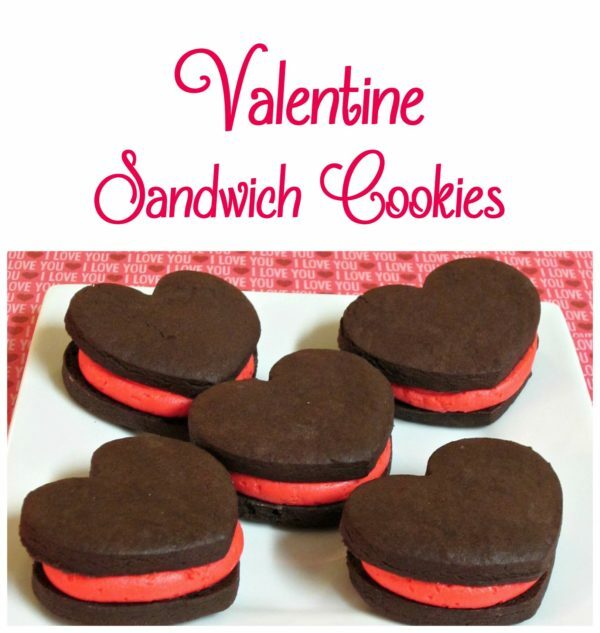 I love when I made homemade Oreos and thought it’d be fun to make something similar but with a Valentine theme. I had seen a recipe from My Kitchen Addiction where she makes homemade Oreos by rolling the dough out and cutting it. 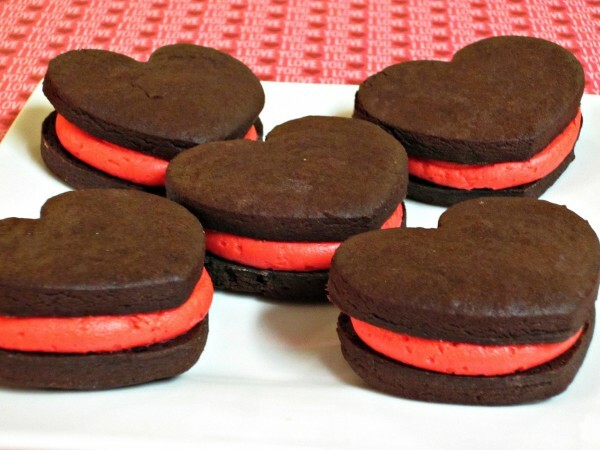 So I used that cookie recipe to make these delicious and cute heart shaped cut-out chocolate cookies then added a pretty pink buttercream frosting. The result was so pretty and even more yummy! The steps are basically the same as making sugar cookie dough you just add Dutch cocoa powder to it. Once the dough comes together you wrap it up and let it firm up in the fridge for an hour. The you roll it out, cut out your shapes, bake it and let it cool. Then I whipped up some lovely buttercream frosting to pipe in the middle and pressed a cookie on top. I picked out the prettiest cookies to go on top. Not only are these cookies gorgeous they are delicious! The cookie tastes like sugar cookies but of course has a lovely chocolate flavor as well. It’s slightly crunchy but at the same time soft and chewy. And the buttercream frosting is amazing! These were a huge hit at my husband’s work today. These are perfect for kids and loved ones around Valentine’s Day or any day of the year! Combine the butter and sugar in a large mixing bowl, and beat on medium speed until light and fluffy. Add the egg and vanilla, and beat until well incorporated. Whisk together the flour, cocoa, baking powder, and salt. Gradually add the dry mixture to the creamed mixture, beating on the lowest speed. Continue to mix on the lowest setting until the dry ingredients are just incorporated. When the dough is chilled, preheat the oven to 350 F. Line a baking sheet with parchment paper or a baking mat. Set aside. Taking only one portion of dough out of the refrigerator at a time, turn the dough out onto a lightly floured surface. Roll the dough to ⅛-1/4 inch thickness. 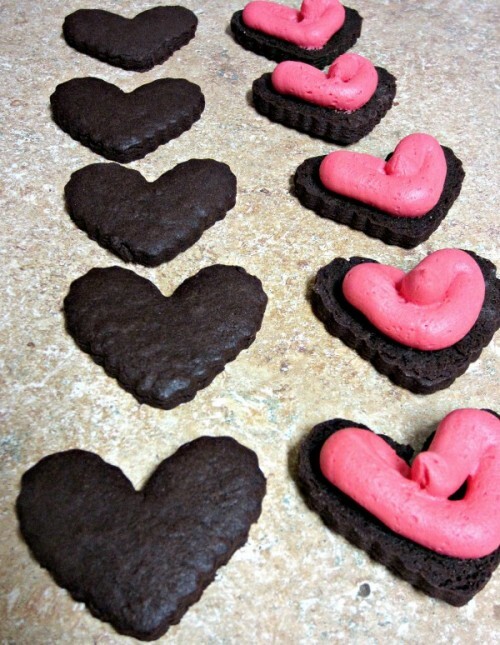 Use a heart shaped cookie cutter to cut out cookies and transfer them to the prepared baking sheet. Bake the cookies for 12 minutes, then transfer to a wire rack to cool completely. Once the cookies are cooled, prepare the filling. Combine the softened butter, half and half, vanilla, and salt and beat until combined. Add the powdered sugar slowly until the filling is smooth. It should be slightly stiffer than cupcake frosting. Add pink or red food coloring until desired color is reached. Transfer the filling to a piping bag fitted with a large round tip (or a freezer zip-lock bag with the corner snipped off.) Pipe the filling onto half of the cookies, and top with the remaining cookies to form a cookie sandwich. Thanks Kristen! haha You make me laugh! It’s totally worth making these though because they are SO delicious! Those are so cute! I bet they are delicious! 🙂 Pinning for later. 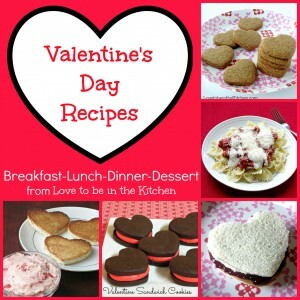 I just saw these at the I Heart Naptime party… so cute… pinned and now following you on FB too! Thanks for stopping by! Great blog, I’m following you on FB too! These are so cute and I bet they taste just as good! Thanks for sharing your recipe. I can’t wait to try them. Thanks Katie! They are SO delicious!! 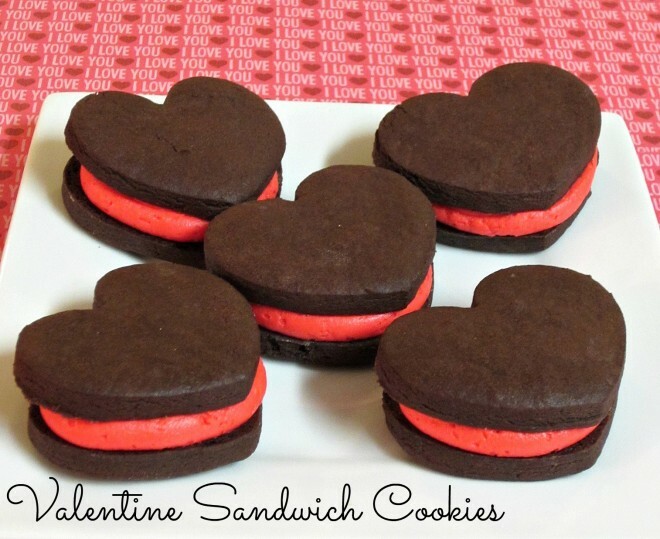 Thanks for sharing these yummy sandwich cookies at The Pin Junkie. They were featured in today’s Valentine’s roundup. http://www.thepinjunkie.com/2014/01/valentines-day-crafts.html Please stop by to grab a featured button and don’t forget to join the party this evening! Hope to see you there!